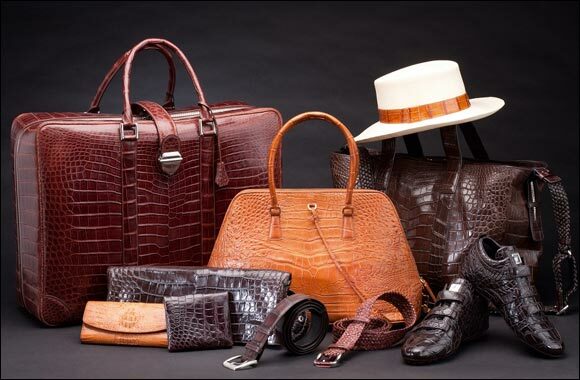 Dubai, April 29, 2015: Biodegradable camel hide, alligator and python skins, and a cow hide collection in 250 colours are among the latest leather trends that will share centre-stage with scores of leather accessories when the Middle East’s only leather trade show opens in Dubai next week. An exclusive Trend Area will be foremost among five dedicated show features at the inaugural edition of Leatherworld Middle East, which takes place from 4-6 May at the Dubai International Convention and Exhibition Centre. Bringing the look and feel of a high-end Parisian leather workshop to the Middle East, the Trend Area will present a dedicated platform showcasing the latest trends and innovations from the workshops of leading Leatherworld Middle East exhibitors. “The Trend Area provides a great opportunity for regional designers, manufacturers, distributors, and retailers to get up close and personal with some of the latest innovations that are shaping the regional and international leather industry,” said Ahmed Pauwels, CEO of Messe Frankfurt Middle East, organiser of Leatherworld Middle East. “The regional market for high-end leather products is among the most exciting in the world and Leatherworld Middle East will play an instrumental role in fuelling further growth by enabling the generation of fresh business deals in the region,” added Pauwels. Leatherworld Middle East’s Trend Area will be curated by the Parisian duo Louis Gerin and Gregory Lamaud, two of the French Capital’s most respected fashion design commentators and experts. “Today innovation has transformed the way we use leather – it can be stretched, washed, deep coloured; it can be ultra-thin or ultra-thick; transparent, light as silk, fragile as paper, or strong as carbon – it’s creation and adaptability has no limits,” said Gerin. At the forefront of exhibitors with products in the Trend Area is Abu Dhabi-based Al Khaznah Tannery, which will showcase its 100 per cent biodegradable and metal-free camel hide, produced using 80 per cent recycled water. German leather manufacturer SoftArt Leder will be making its regional debut at the Trend Area with a range of leathers for upholstery, accessories, shoes and equestrian, that come in 250 colours. “We are exhibiting at Leatherworld Middle East because we believe our product range fits the needs of the Middle East market,” said Markus Heckmann, Managing Director at SoftArt Leder. Other exhibitors debuting in the Middle East with their latest products in the Trend Area include French giants Bodin Joyeux and Pechdo, Agile Exim, H&K Exports, CV Moda Leather and S.S. Leathers. Leatherworld Middle East is the region’s first and only dedicated trade event covering the entire value chain of the global leather industry, from tanneries (semi-finished and finished leather), chemicals, and machinery to finished leather goods, including footwear, bags, wallets, accessories, furniture and everything derived from leather. Other features of the three-day event include Leather Production, a dedicated area for tanneries and dealers of semi-finished and finished leathers; Fashion Avenue and Shoe Box – two sections full of new leather items such as handbags, wallets, accessories and footwear; and the Designers’ Area – a setting for buyers to meet designers and search for bespoke designs for boutiques and department stores. Leatherworld Middle East 2015 will feature more than 85 exhibitors from China, Egypt, Germany, India, Indonesia, Italy, Pakistan, Senegal, Spain, the UK, USA, and the UAE. The region’s annual leather showpiece is supported by Founding Sponsor Al Khaznah Tannery, Official Show Supporter ESMOD Dubai, and Supporting Associations, the French Federation of Tanners, the French Skins and Hides Syndicate, and the National Tanning Industry Union from Italy.